The VitaElegante collection by MARAZZI is a glazed porcelain tile portrayed as a modern interpretation of classic stones. VitaElegante Bianco is a 6 in. x 24 in. porcelain tile that captures the rich color variations, dramatic veining and sensuous movement of calacatta marble. Available in a plank format with minimal pattern repeat, it can be installed on both floors and walls for an elegant style upgrade to any decor. Classic white with gray veining provides an outstanding array of options for creating truly unique designs. 14.53 square feet; 15 pieces per case. Case weight is 57.97 lb. 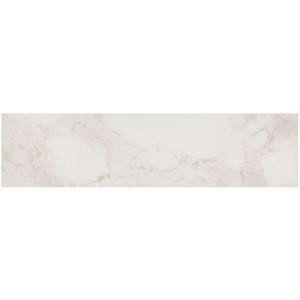 Buy online MARAZZI VitaElegante Bianco 6 in. x 24 in. Porcelain Floor and Wall Tile (14.53 sq. ft. / case) ULP6, leave review and share Your friends.